One of the most popular trends that got out in the past few years and still has its hold on us is definitely the ombre. You’ve seen it everywhere – clothes, hair, makeup and decorations. Not everyone is a fan of creating decorations, but we really picked ten very easy and budget – friendly DIY decorations that hopefully will change your mind. The beautiful combinations of various colors and their shades has the power to make any item so pretty! We had hard times choosing only ten, but we made our decision and we’re happy to share it with you. 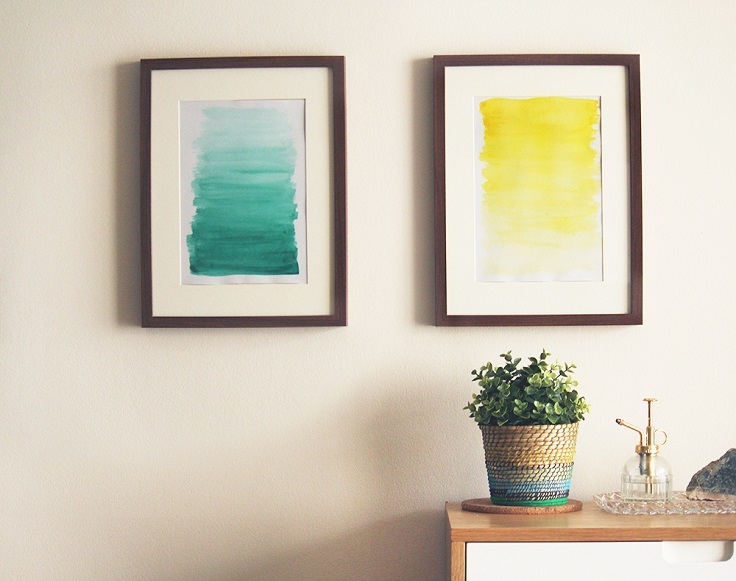 We hope that you will find your future ombre decoration right here! It’s amazing how a piece of yarn can turn into a beautiful tassel, and then that tassel into a beautiful home decor. The best part of all is that it won’t cost you a lot and you can create it the way you want! 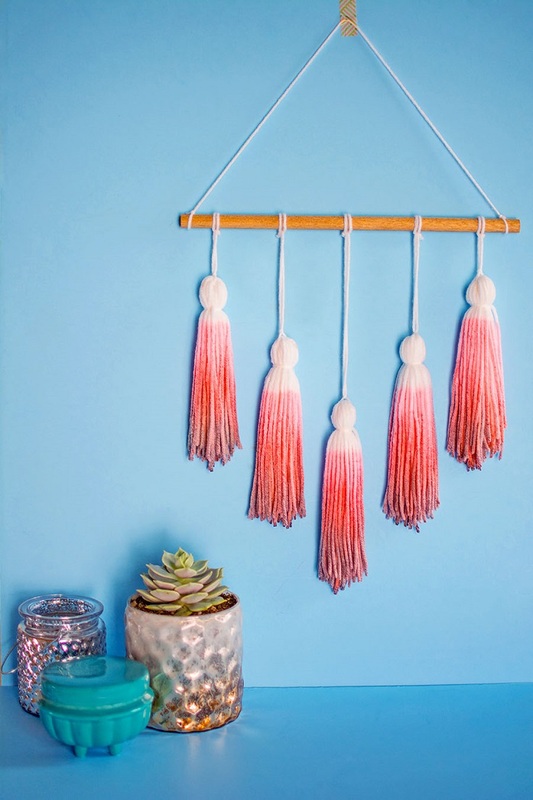 To make these ombre wall tassels, you need yarn (natural or undyed), small book or notebook, scissors, kool-aid packets, dish soap and wood dowel. It’s really easy to make it, just carefully follow the instructions on the website below. 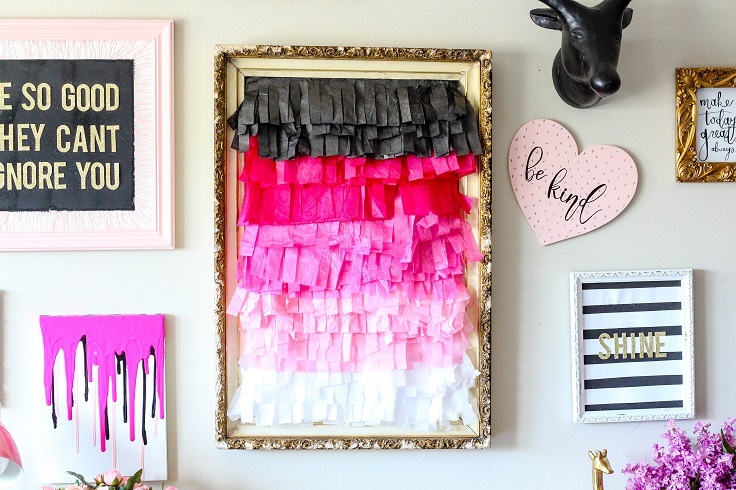 If you were looking for a new wall decor for your office, here’s how you can include fringe in it. It costs so little and it looks so great! You need a frame, tissue paper, nail and a scotch tape. You can see here how pink ombre looks amazing, but if that’s not your color you can pick whatever you want – it’s all about getting creative and having fun with it! It’s amazing how many crafts can be made out of old mason jars. They all are great not only because they look amazing and are the cheap way out, but using old mason jars also means being eco-friendly! For this project, you need 3 – 5 wide mouth mason jars, 3 – 5 acrylic paints in varying shades from dark to light, 1 can of white spray paint or primer, foam brushes and flowers or greenery of your choice. 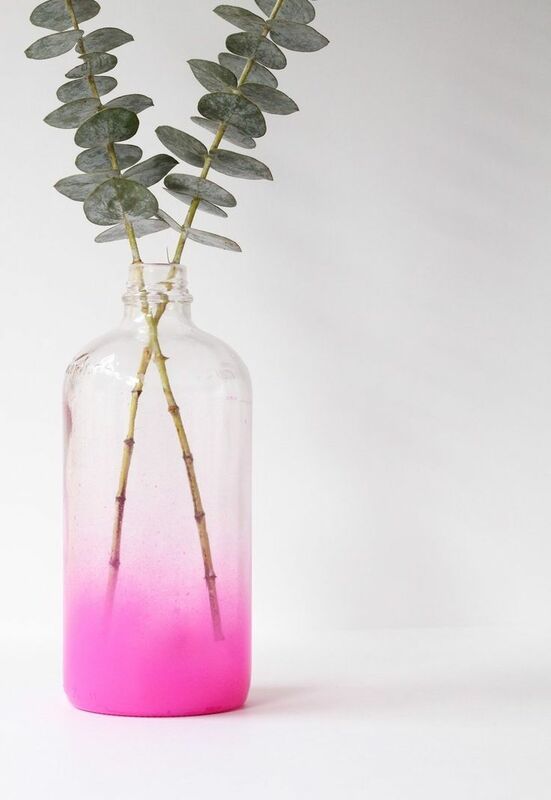 It would be so nice to have fresh flowers in such a beautiful vase! We’re pretty sure that you are used to being clocks when the old one stops working or gets broken, but have you ever considered creating your very own clock? It can be super fun, easy and creative! 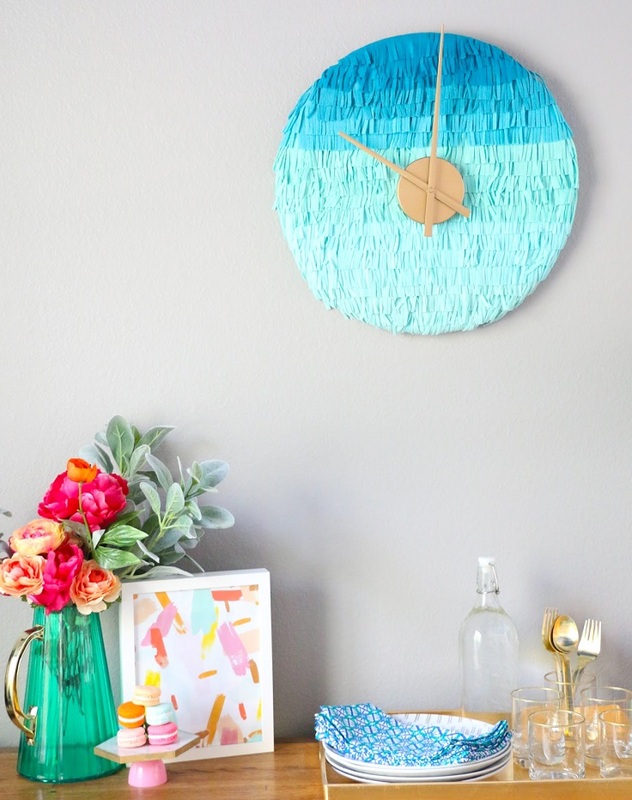 Just look at this gorgeous blue fringe clock – isn’t it adorable? You will need these materials – 2 pieces each of of 9″ by 12″ felt in 6 different shades of blue, 18″ wood round, hot glue, modern clock movement, gold spray paint and shellac, scissors, screw, and wall mounting hardware. Need new glasses? This one is an idea that we fell in love with – these are so delicate that we wanted them right away! This is a very simple project that you can easily make even if you’re not used to DIY and note that these glasses are hand wash only. 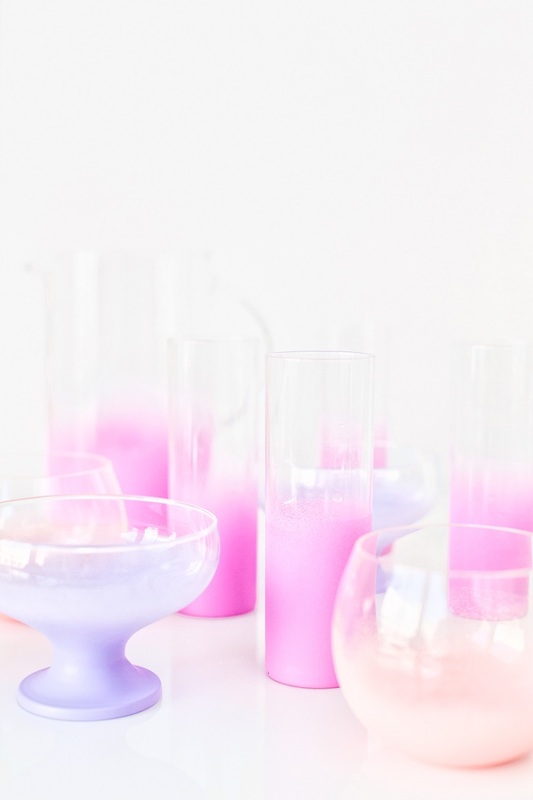 These are the materials you need to make them – plain glassware, non-toxic spray paint, painter’s tape and newspaper or cardboard. 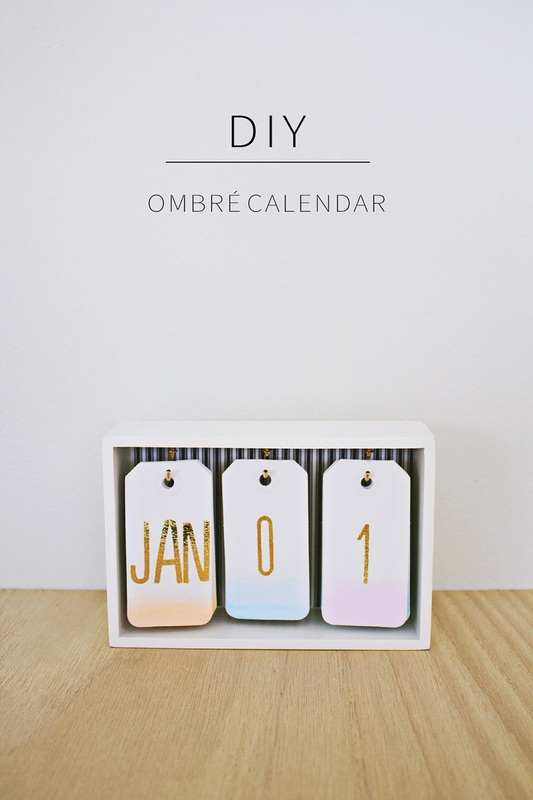 This desk calendar is the perfect little detail that you can put in any room, especially on your office desk. It doesn’t take too much space, it is practical and it looks so pretty! You will want to check the date every time! You need gold rub – on transfers, 1 sheet of patterned paper, small wooden box, 3 small C-hooks, white eyelet gift tags, Modge Podge, sponge brush, watercolors and brush, pencil, measuring tape and scissors. Here’s another super easy, cheap idea on how to add new decor in your home. 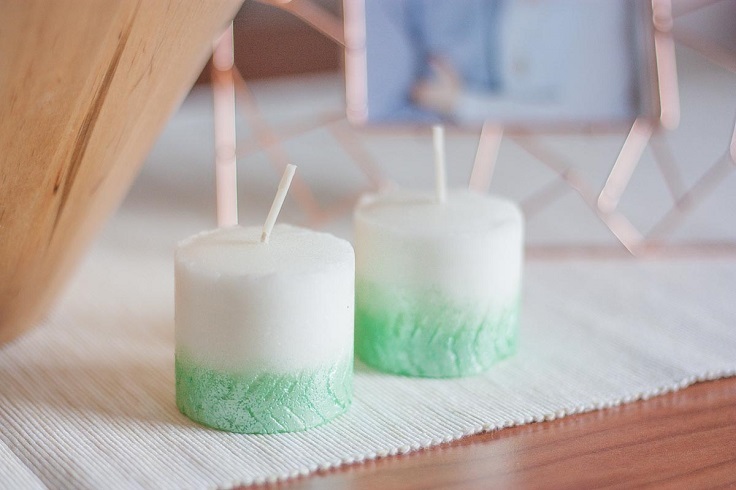 Instead of buying fancy and expensive candles, you can buy plain white candles and paint them ombre! It’s really easy and it doesn’t require any artistic skills. Just make sure you have candles, pin, fave acrylic paint and a brush. Not everyone is born to be the next Picasso, but this watercolor art is so easy that you’ll want to make more pictures in different colors! This is a very good decor idea because it can make white walls stand out from the crowd. You don’t need too many materials, water colour paints, paint brushes, few sheets of A4 watercolour paper or bigger, it depends on how big is your frame, 2 x picture frames and 2 small cups of water. 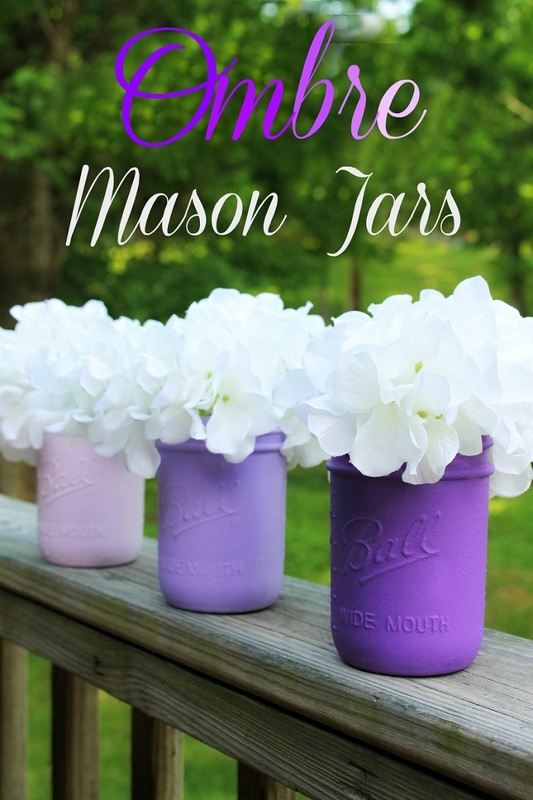 We have already shown you how you can transform old and used mason jar into a beautiful vase for flowers, and here’s a similar idea. You need only three materials – spray paint, glass bottle and rubbing alcohol, how cheap is that? This is really one of the cheapest projects on this list that you can make anytime. Here’s one project that you can make for your kitchen, or even bathroom. Very often we overlook the potential that the towels have for being the perfect little detail in the room. 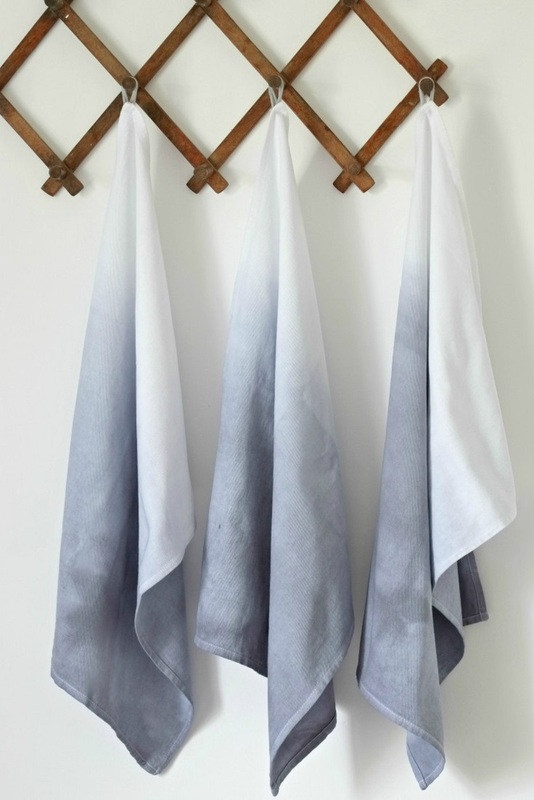 With little effort, you can turn the dull, white towels into ombre pieces that everyone is going to ask you where you get them from. You need plain cotton tea towels, Rit Dye or similar, plastic tub/bucket, gloves and metal spoon.